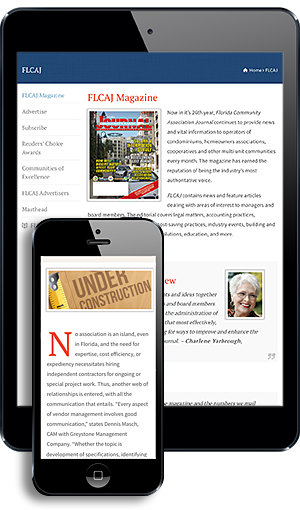 Make an investment in yourself with a subscription to the Florida Community Association Journal, your ticket to success in your new role as a board member or licensed manager in Florida’s highly regulated community association industry. A 12 or 36 month subscription to FLCAJ provides news and vital information to operators of condominiums, homeowners associations, cooperatives, timeshares, and other multi-unit communities. Don’t miss an issue. Renew your current subscription today. Click here to pay a subscription invoice you received by mail. Before you head north for the summer or fly south for winter, change your mailing address so your subscription follows wherever you go.